That is a really good voxel and should be moved. It has been? Your reply was after it was moved? It is spotlighted. Its in the damn spotlighted forum, you all replied to it while it was in that forum, no need to say it should be moved here when it already is!! Just blame timezones, they are probably a day behind anyway . Thats really awsome, a true example of how voxeling should be done. 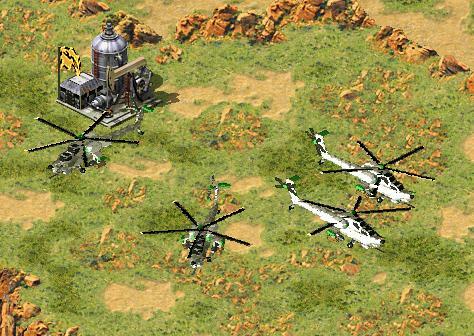 I agree with Ackron that you should do a Mi-24. I you just can't miss such a legendary helicopter. Make a Hind tomorrow or ch00 will die a slow, painful death by poking. But make one soon plz. Here ya go looks good ! gonna resize it then post it. maybe the same for his other helis. its like 2 times the size of anything considered usable. Thanks for pointlessly bumping this 8 year old topic with such an outstanding and useful promise that such a grand person like you would even consider doing so. If you couldn't tell, that was sarcasm. This guy breaks so many rules that he knows full well, how is he not banned? lol posting something relevant is not against the rule no matter the age. done resizing before btw. don't speak to me again. hm the main body I was able to but the rotors are tricky. no clue how to get them properly to the right position in each frame. 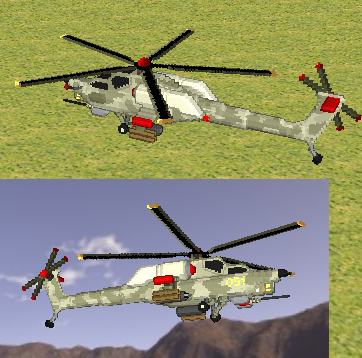 Looks perfect in the voxel viewer but ingame the rotors are far away from the right position. Could take a while. Maybe chopper resizing isn't my thing. At this point I sunk 2 hours into it and it failed so I am gonna do the least which is an ingame picture of the original. damn rotors. I remember when this voxel was posted. God, that was a long time ago. The proper way to post would be to post the resized voxel, not say you're going to do it and never do it. And clearly DOUBLE POSTING isn't against the rules at all, because you do it all the time. Because Banshee only bans me. He hasn't done that in a while. Aren't I due for one? And he releases some information about Final Dawn. So in other words, hell will freeze over first. I got it.